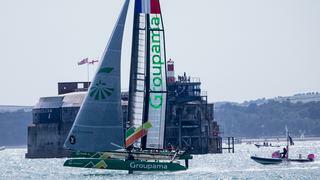 Groupama Team France took fourth place in the Louis Vuitton America's Cup World Series Portsmouth event. 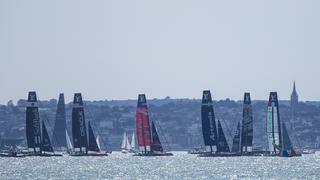 "There were so many people watching and it was well organised for the first event on the circuit," said France's skipper Franck Cammas. "I'm very confident for the future as we look ahead." Groupama Team France took fourth place in the Louis Vuitton America's Cup World Series Portsmouth event. 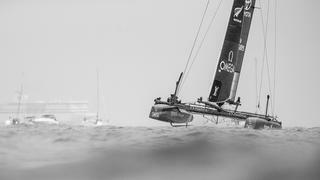 "There were so many people watching and it was well organised for the first event on the circuit," said France's skipper Franck Cammas. "I'm very confident for the future as we look ahead." 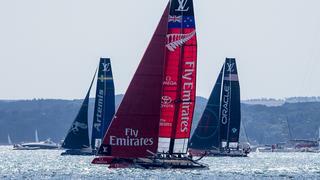 Six teams competed in the first Louis Vuitton America's Cup World Series race, beginning to accumulate points towards winning the America's Cup in Bermuda in 2017. 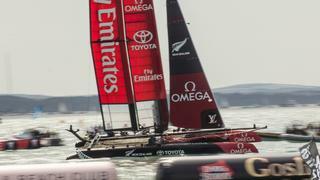 America's Cup regatta rookie Peter Burling was at the helm of Emirates Team New Zealand, leading the Kiwis to a second place seat on Saturday's race. "It was great to be able to race against the others," Groupama Team France's Skipper Franck Cammas said of competing in the first Louis Vuitton America's Cup World series race. "At home, we train alone and when you sail alone you are always the world champion! So we found the level here is very high. Not a surprise, but good to see, and very motivating for us to improve." 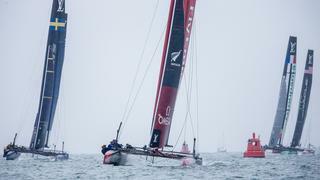 The Louis Vuitton America's World Series Portsmouth provided some truly exciting racing action and showed off what these hydrofoiling catamarans are capable of doing out on the racecourse. America's Cup Defender, Team Oracle USA (far right), claimed third place. 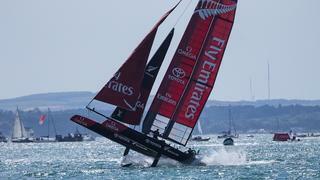 "The racing was great," said Oracle Team USA skipper Jimmy Spithill. 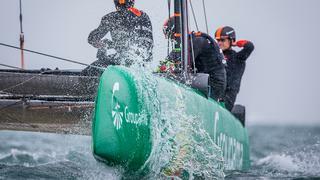 "We had some good sailing out there. Lots of lead changes, six competitive teams, the level is really, really high." Racing was cancelled on Sunday due to extreme winds, so the results from Saturday's racing stand for the Louis Vuitton America's Cup World Series Portsmouth. The final standing sees Britian's Land Rover BAR with 19 points, Emirates Team New Zealand with 18, while Oracle Team USA has 16, Groupama Team France and SoftBank Team Japan are tied with 13, and Sweden's Artemis Racing has 11 points. The inclement weather didn't put a damper on the festivities of celebrations of hometown heroes Land Rover BAR winning the first Louis Vuitton America's Cup World Series, including a visit from the Duke and Duchess of Cambridge. 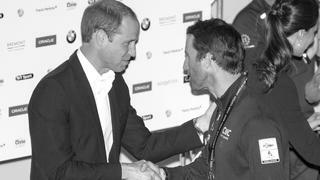 Above, Kate Middleton congratulations Ben Ainslie on his team's win. The Duke and Duchess of Cambridge, Prince William and Kate Middleton, were on site all of Sunday at the Louis Vuitton America's Cup World Series in Portsmouth. The Royal visit included meeting with all the America's Cup teams and presenting the regatta awards to winning to team, Britain's own Land Rover BAR. Louis Vuitton CEO Michael Burke also presented each skipper with a gift. Ben Ainslie, skipper of Land Rover BAR, is showered in champagne during the awards presentation of the first Louis Vuitton America's Cup World Series event. Land Rover BAR completed the first step in the British team's goal to bring the Cup home by taking first place at the Louis Vuitton America's Cup World Series Portsmouth. The team is currently leading with top points as we head into the second Louis Vuitton America's Cup World Series showdown in Gothenburg, Sweden August 28-30. The Swedish Challenger, Artemis Racing, will be seeking to improve on its last place finish for this homecoming event.